Looking for dividend income that can help pay the retirement bills through good times and bad? This trio should be on your short list. When you hit your retirement years, your investment goal is likely to switch from accumulation of assets to living off of the assets you have managed to save. One great way to do that and avoid touching your nest egg is to buy dividend-paying stocks. Healthcare property owner Welltower (NYSE:WELL), diversified medical products company Johnson & Johnson (NYSE:JNJ), and midstream energy giant Enterprise Products Partners (NYSE:EPD) can all help provide the cash you need to fund a happy and healthy retirement without the need to sell the investments you own. Keith Speights (Welltower): Retirees like stocks that pay solid dividends. Welltower definitely fits the bill, with its dividend currently yielding an attractive 4.8%. As a real estate investment trust (REIT), the company must distribute at least 90% of its taxable income to shareholders in the form of dividends. Welltower is the largest healthcare REIT in the U.S. It owns more than 1,500 healthcare properties in the U.S., Canada, and the United Kingdom. These properties include senior housing, post-acute-care communities, and outpatient medical facilities. What's especially attractive about Welltower is that it focuses primarily on properties in major high-growth urban markets. These markets appeal to more seniors and have relatively high barriers to entry. I've stated in the past that Welltower is "a retiree's dream stock." I still think that's the case. In addition to its great dividend, the company's long-term growth prospects look very good. The number of Americans ages 65 and older is expected to increase by 36% through 2025. That should drive higher demand for Welltower's senior housing properties. And with the population of Americans aged 85 and over likely to double over the next 20 years, demand for Welltower's post-acute-care properties should also soar. Brian Stoffel (Johnson & Johnson): Admittedly, I'm not at the point in life at which I'm investing in dividend-paying "retirement" stocks. If I was, however, Johnson & Johnson would be at the top of my list -- for two big reasons. The first is that the conglomerate has diverse revenue streams. While we're all familiar with Band-Aids, Tylenol, and Benadryl, those consumer-facing products -- which are subject to intense margin pressure -- accounted for just 18% of sales last year. The medical device division contributed another 35%; pharmaceuticals -- led by Remicade, Stelara, and Xarelto -- accounted for the biggest chunk: 47% of all sales. While the pharmaceutical segment is clearly the most important, these diverse streams are critical: they are protected by different moats and can pick up the slack for one another during an off year. The other big reason I like the dividend is its sustainability. Johnson & Johnson has increased its dividend every year for 55 consecutive years. Over the past 12 months, the dividend has eaten up just 50% of free cash flow. 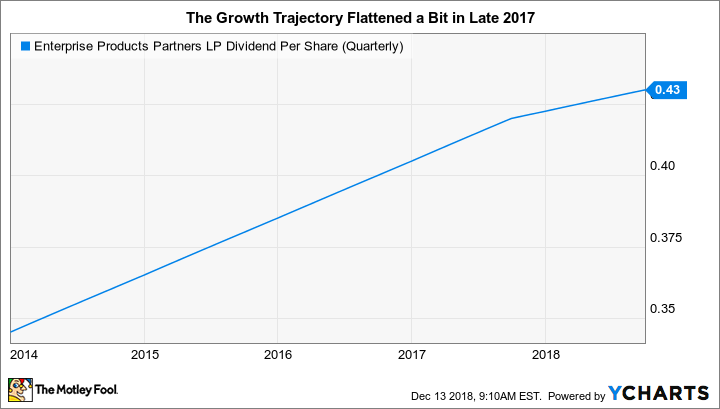 This means the dividend is very safe, and there's still ample room for growth despite the negative headlines surrounding the stock today. Reuben Gregg Brewer (Enterprise Products Partners): Enterprise is a bellwether in the midstream energy space. The nearly $60 billion-market-cap giant owns a diverse collection of pipeline, processing, storage, and transportation assets. And it offers a 6.6% yield backed by 21 years of annual distribution increases. Distribution coverage is impressive at 1.6 times -- well above the 1.2 times that investors consider strong. Some background is needed on the coverage figure. Historically, Enterprise targeted around 1.2 times, but it recently shifted toward a self-funding model to reduce the amount of dilutive units issued to support capital spending. Part of that shift requires a temporary slowing of distribution growth (to the low single digits from the mid single digits) to allow the current round of expansion projects to bear fruit. EPD Dividend Per Share (Quarterly) data by YCharts. Once they are producing cash, which today's huge coverage ratio shows is happening, Enterprise will be able to put that money toward future growth spending and eventually bring its distribution growth back up to historical levels again when this transition period is complete. The big takeaway is that the temporary slowdown is making Enterprise a safer investment. Retirees should like the story so far: a big yield from a conservative business. But here's the interesting part: Enterprise is a limited partnership. A portion of its distribution is return of capital, which avoids current taxation (these payments reduce your cost basis and, thus, get taxed when you sell the units). Although it's a complicated tax issue, not only is Enterprise offering a big yield from a conservative business, it also helps keep taxes to a minimum because of the partnership structure. Just make sure you own it in a taxable account, because limited partnerships don't play well with tax-advantaged accounts.